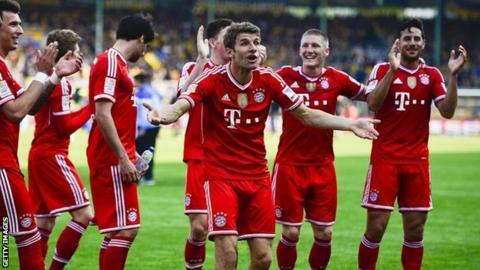 Champions Bayern Munich left it late to beat relegation-threatened Eintracht Braunschweig for their first Bundesliga victory in four games. The European champions won the title by beating Hertha Berlin on 25 March but had failed to win a league game since then. For 75 minutes it looked like that run might be extended, until Claudio Pizarro converted Mario Gotze's pass. Coach Pep Guardiola sent out a strong side despite the fact they visit Real Madrid in the Champions League semi-final first leg on Wednesday. And substitute Mario Mandzukic sealed the victory with four minutes left as he converted a long ball from goalkeeper Lukas Raeder, the first keeper to assist a Bundesliga goal this season. Second-placed Borussia Dortmund, who will face Bayern in the German Cup final next month, beat Mainz 4-2. Their goals were scored by Milos Jojic, Bayern-bound Robert Lewandowski, Lukasz Piszczek and Marco Reus. Match ends, Eintracht Braunschweig 0, FC Bayern München 2. Second Half ends, Eintracht Braunschweig 0, FC Bayern München 2. Corner, Eintracht Braunschweig. Conceded by Mitchell Weiser. Foul by Mario Mandzukic (FC Bayern München). Deniz Dogan (Eintracht Braunschweig) wins a free kick on the left wing. Offside, FC Bayern München. Mario Mandzukic tries a through ball, but Thomas Müller is caught offside. Bastian Schweinsteiger (FC Bayern München) is shown the yellow card. Foul by Bastian Schweinsteiger (FC Bayern München). Deniz Dogan (Eintracht Braunschweig) wins a free kick in the defensive half. Foul by Pierre-Emile Höjbjerg (FC Bayern München). Orhan Ademi (Eintracht Braunschweig) wins a free kick in the defensive half. Substitution, FC Bayern München. Mitchell Weiser replaces Philipp Lahm. Goal! Eintracht Braunschweig 0, FC Bayern München 2. Mario Mandzukic (FC Bayern München) left footed shot from the left side of the box to the bottom left corner. Assisted by Lukas Raeder. Hand ball by Jerome Boateng (FC Bayern München). Corner, Eintracht Braunschweig. Conceded by Javi Martínez. Attempt blocked. Marc Pfitzner (Eintracht Braunschweig) left footed shot from outside the box is blocked. Substitution, Eintracht Braunschweig. Orhan Ademi replaces Dennis Kruppke. Attempt missed. Mirko Boland (Eintracht Braunschweig) right footed shot from outside the box is too high. Assisted by Marc Pfitzner. Ken Reichel (Eintracht Braunschweig) wins a free kick in the defensive half. Delay in match Marco Caligiuri (Eintracht Braunschweig) because of an injury. Offside, FC Bayern München. Claudio Pizarro tries a through ball, but Jerome Boateng is caught offside. Attempt blocked. Mario Mandzukic (FC Bayern München) right footed shot from the right side of the box is blocked. Assisted by Pierre-Emile Höjbjerg with a cross. Corner, FC Bayern München. Conceded by Omar Elabdellaoui. Attempt blocked. Javi Martínez (FC Bayern München) right footed shot from the left side of the box is blocked. Assisted by Pierre-Emile Höjbjerg with a cross. Matthias Henn (Eintracht Braunschweig) is shown the yellow card for a bad foul. Mario Mandzukic (FC Bayern München) wins a free kick on the left wing. Foul by Matthias Henn (Eintracht Braunschweig). Goal! Eintracht Braunschweig 0, FC Bayern München 1. Claudio Pizarro (FC Bayern München) left footed shot from the left side of the box to the top left corner. Assisted by Mario Götze. Substitution, Eintracht Braunschweig. Marc Pfitzner replaces Kevin Kratz. Substitution, FC Bayern München. Mario Mandzukic replaces Arjen Robben. Substitution, FC Bayern München. Thomas Müller replaces Franck Ribéry. Substitution, Eintracht Braunschweig. Marco Caligiuri replaces Jan Hochscheidt. Foul by Havard Nielsen (Eintracht Braunschweig). Franck Ribéry (FC Bayern München) wins a free kick in the defensive half. Foul by Kevin Kratz (Eintracht Braunschweig). Attempt missed. Dante (FC Bayern München) header from the centre of the box is too high. Assisted by Arjen Robben with a cross following a corner. Corner, FC Bayern München. Conceded by Matthias Henn.